Purge print jobs from the printer. This is very useful if the printer show an error of “Other”, indicating that Windows doesn’t know what’s wrong. Automatic updates. You’ll need to update once, but it will keep itself updated on a regular basis going forward. New view menu for a client level view. There’s a new menu item in the View menu that will allow you to view printer supply levels easily. This includes toner/ink and imaging unit levels, as well as page print counts. The view menu also allows you to see printer errors, problems, maintenance needs and more at-a-glance. This information is available for printers detected by network probes via snmp. 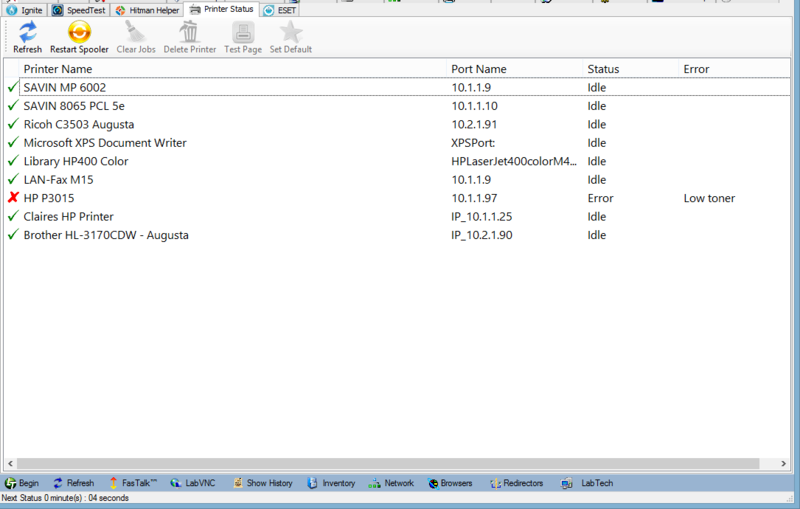 You can also refresh printer information from the network probe while in the View menu to make sure you’re up-to-date. This uses Windows VBS scripts that are built-in to detect printers and their status. Unfortunately it may not show printers that are added as network shares as opposed to IP. Those deployed via GPO as an IP should show up. Note also that it’s Windows 7 and up and XP/Vista don’t have the needed VBS files. I actually hadn’t looked into supporting multiple languages, but I’ll see what can be done about that. Thanks for the feedback! Has anyone found a good way to update the printer port(IP Address) from within labtech? Any chance you could have the list of printers indicate which printer is the current default printer? That seems reasonable. I’ll see what I can do about that. Any update on the request to see which printer is default? Also network printers do not show up in the plugin, but are picked up by Labtech under the device \printers tab. I’m sorry, but somehow that was forgotten. I’ve got it back on the feature list so I can get it tackled. Is there a way to show network printers as well?